She relates the case of a young man who now sleeps with a bag of underwear next to his bed because he is in constant fear of re-arrest. Another case that left its mark on Jabr was that of a sisters whose mother was arrested by Israeli soldiers in a raid on their home. Fearing another raid, the girls slept in the middle room of the house for months instead of their bedrooms, fully dressed and wearing their headscarves. Jabr’s encounters and insights into the psychological impact of life in Palestine were the subject of a documentary released in theatres in France last month. In the film, she narrates excerpts from her writings addressing what resistance means in the context of the Israeli occupation. French film director Alexandra Dols contacted Jabr at end of 2012 wanting to feature her writings as the foundation of the documentary after she came across an article Jabr wrote in 2007 for the Washington Report on Middle East affairs entitled “Dancing to Different Drummers – But Dancing, Nevertheless”, which explored what one act meant to different individuals. The article starts off with an encounter with a patient of hers telling her how she was “dancing like a slaughtered chicken” when her son was killed, and then follows her other encounters that day with Israeli soldiers dancing at a checkpoint and later herself dancing at a family wedding. At least six Palestinians were injured with live ammunition and others suffocated by tear gas as clashes continued, along the Gaza borders, in protest of US President Donald Trump’s recognition of Jerusalem as Israeli’s capital, said sources. Israeli army forces deployed along the eastern borders between Gaza and Israel fired live ammunition and tear gas canisters at Palestinian youth who demonstrated near the borders. Six youth were shot and injured with live ammunition and transferred to hospitals and medical facilities for medical treatment. Their medical conditions were described as moderate. Many others suffocated after inhaling tear gas fired by the army. Two Palestinians were killed and at least 103 others injured with live ammunition during violent clashes that broke out during protests along the Gaza borders on Friday. WAFA further reports that a journalist and a woman, Saturday, were injured in Jerusalem as Israeli police continued to crack down on Palestinian protesters who took to the streets to protest the Trump decision. Israeli forces used excessive force to disperse protesters who demonstrated outside Bab al-Amoud, one of the old gates in the old city of Jerusalem, against Trump’s Jerusalem declaration. A journalist and a woman were injured after being physically attacked by Israeli police forces. A Jerusalemite activist was also detained during a similar demonstration that took place in Salah Eddin Street, in central Jerusalem. Clashes reportedly erupted in Salah Eddin Street as Israeli police suppressed demonstrators. Tear gas canisters were used, but no injuries were reported. A beefed-up presence of security forces has been witnessed across Jerusalem since the early morning hours as rallies continued in protest of Trump’s announcement. In related news, Israeli media has reportedly waged a hate campaign against Palestinian journalists following false info that Mohammed Aqel, who attacked Israeli soldiers near the military checkpoint known as DCO, at the northern entrance to the city of el-Bireh near Ramallah, was a journalist. A lawyer with the Palestinian Prisoners’ Society managed to visit a Palestinian child, who was assaulted and abducted by 23 Israeli soldiers on December 7th, and informed him of horrific violations, abuse and torture. The lawyer managed to visit Mohammad Fawzi al-Juneidi, 16, who is held in Ofer Israeli prison and military base, near Ramallah. The child said that prior to his abduction, a soldier started beating him on the chest, using his weapon in striking him, after stopping him while walking in an area close to where clashes were taking place when the soldiers resorted to excessive forces against Palestinian protesters. The child was walking to his relatives’ home in the Tuffah Street area, in Hebron, in the southern part of the occupied West Bank. He added that, after one soldier started beating and kicking him, before at least 23 other soldiers joined him, and started hurling insults at the child, and some of them started beating and kicking him, while he was on the ground. The soldiers then cuffed him with plastic cuffs that caused bruises and lacerations in his skin, and blindfolded him, before taking him away, after he lost his shoes, and again, started kicking and beating him, while hurling insults. The child stated that he asked the soldiers to bring him his shoe, but they removed his other shoe instead and forced him to walk barefooted. He was later placed in a dark room, while some soldiers poured cold water on his feet before repeatedly stomping on them. The soldiers continuously beat and clubbed the child, causing cuts and bruises to various parts of his body, and tried to send him to Etzion military base, north of Hebron, but the administration there refused to receive him due to his serious injuries. He was moved to an Israeli hospital, and was later transferred to Ofer prison. The child was subject to harsh interrogation in Ofer, while chained and cuffed, and neither his lawyer, nor any member of his family, could attend the interrogation. One of the interrogators forced him to sign a statement, written in Hebrew without any interpretation or translation. 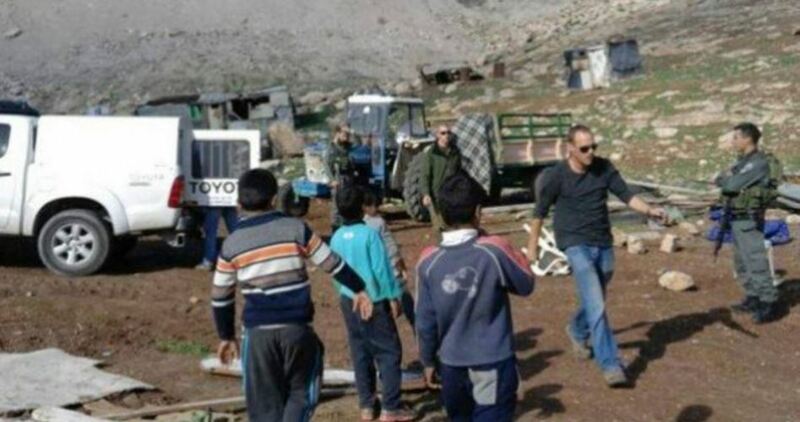 A group of extremist Israeli colonists, illegal living on Palestinian lands in the occupied West Bank, uprooted more than approximately 500 Dunams of Palestinian lands, in Orif village, south of the northern West Bank city of Nablus. The Israeli assailants came from the illegal Yitzhar colony, and uprooted 500 Dunams (123.5 Acres) in Masahel area, in ‘Orif. The lands are privately owned by many Palestinian families, including al-Asmar, Dar Khalil and Dar Jaber. It is part of ongoing g assaults targeting the Palestinians and their lands in several parts of the West Bank. Such attacks include uprooting farmlands and orchards, burning them, especially olive trees, in addition to flooding them with sewage. Photo: Damage of houses belonging to Al-Najjar Family in Mawasi in Khan Younis after Israeli forces targeted a nearby agricultural land on Wednesday dawn, 13 December 2017. Israeli forces continued with systematic crimes in the occupied Palestinian territory (oPt) for the week of 07 – 13 December, 2017. Israeli forces escalated the excessive use of force against protests in the West Bank and Gaza Strip. A Palestinian civilian was killed and 446 civilians; including 71 children, one woman and 12 journalists, were wounded in the West Bank and Gaza Strip. Israeli warplanes carried out several airstrikes at different targets in the Gaza Strip. During the reporting period, Israeli forces killed 2 Palestinian civilians in the Gaza Strip and wounded 265 Palestinian civilians; including 49 children, 5 women and 2 journalists, in the Gaza Strip. Meanwhile, in the West Bank, 204 civilians, including 30 children and 10 journalists, were wounded. Thus, the total number of wounded persons in the Gaza Strip and West Bank amounted to 491 persons, including 79 children and 5 women. Moreover, in the Gaza Strip, Israeli warplanes carried out many airstrikes targeting military training sites and watchtowers belonging to the Palestinian armed groups, resulting in the injury of many Palestinian civilians and damage to their property. The Israeli forces continued to chase fishermen in the Gaza Sea and target border areas in the Gaza Strip. In the Gaza Strip, on 08 December 2017, in a new crime of excessive use of force, Israeli forces killed Mahmoud al-Masri (29) when they opened fire at dozens of Palestinian young men and youngsters who were protesting 10 meters away from the border fence between the Gaza Strip and Israel, east of Khan Younis. On the same day, Maher ‘Atallah (54) was killed when Israeli warplanes targeted a military site belonging to al-Qassam Brigades, the military wing of Hamas movement, southeast of Beit Lahia in the northern Gaza Strip. The aforementioned sustained bruises throughout his body and suffered a severe drop in the heart rate as he is a heart patient when he was in front of his house, which is 100 meters away from the targeted site. Moreover, 21 civilians, including 7 children and 4 women, were wounded. Northern Gaza Strip: the incidents were mainly in the vicinity of al-Shuhadaa’ Cemetery, east of Jabalia and in the vicinity of Beit Hanoun Crossing. As a result, 96 Palestinians, including 22 children, were wounded; 40 were hit with live bullets; 4 were hit with rubber-coated metal bullets; and 52 were hit with tear gas canisters. Gaza City: the clashes were mainly near former Nahal Oz Crossing, east of al-Shuja’iyah neighbourhood. As a result, 58 Palestinianswere wounded. Twenty-five of them were hit with live bullets, 5 were hit with rubber-coated metal bullets, and 28 were hit with tear gas canisters. Central Gaza Strip: the clashes occurred in the eastern side of al-Bureij refugee camp. As a result, 13 Palestinians, including 2 children, were wounded; 12 of them were hit with live bullets while the tenth was hit with a tear gas canister to his body. Khan Younis: The clashes and Israeli shooting were concentrated in 4 areas: ‘Abasan al-Kabirah; Khuza’ah; al-Fukhari and al-Qararah. As a result, 65 Palestinians, including 16 children, were wounded; 29 of them were hit with live bullets, 14 were hit with rubber-coated bullets and 22 were hit with tear gas canisters. Rafah: The clashes mainly occurred in al-Shokah village. As a result, 12 Palestinians were wounded, including 2 children. Eleven of them were hit with live bullets, and 1 was hit with a tear gas canister to his body. As part of the Israeli airstrikes, Israeli warplanes carried out several airstrikes targeting military training sites and watchtowers belonging to the Palestinian armed groups. As a result, 3 residential buildings and a school in northern Gaza sustained damage while 11 residential houses were partially damaged, west of Khan Younis in the southern Gaza Strip. In the Gaza Strip, as part of targeting fishermen in the sea, PCHR monitored the Israeli naval forces’ escalation against fishermen in the Gaza Sea as on 12 December 2017; the Israeli forces decreased the allowed fishing area from 9 to 6 nautical miles. This proves that the Israeli forces continue their policy of targeting fishermen in their livelihoods. During the reporting period, Israeli gunboats chased fishing boats and opened fire at them 8 times; 4 of them in the north-western Beit Lahia and the 4 others in the western Soudaniyah area, west of Jabalia in the northern Gaza Strip. As part of targeting the border areas, PCHR documented 8 shelling and shooting incidents at the areas along the border fence between the Gaza Strip and Israel. In northern Gaza, Israeli forces carried out 5 incidents while 1 in Gaza City and 3 in central Gaza Strip. Moreover, Israeli forces shelled many sites and watchtowers belonging to the armed groups. Jerusalem: The clashes resulted in the injury of 5 civilians, including 3 children. Three were hit with live bullets and two with tear gas canisters. Ramallah and al-Bireh: The clashes resulted in the injury of 109 civilians, including 12 children. Four were hit with live bullets, 66 were hit with rubber-coated metal bullets and 39 were directly with tear gas canisters at their bodies. Hebron: The clashes resulted in the injury of 13 civilians, including 2 children. Nine were hit with live bullets and two with rubber-coated metal bullets. Nablus: The clashes resulted in the injury of 11 civilians, including a child, with rubber-coated metal bullets. Qalqiliyah: The clashes resulted in the injury of 20 civilians, including 5 children. Forty-two were hit with live bullets, 14 were hit with rubber-coated metal bullets, and 4 were directly with tear gas canisters at their bodies. Tulkarm: The clashes resulted in the injury of 31 civilians, including 7 children. Twenty-one were hit with live bullets, 8 were hit with rubber-coated metal bullets and 2 were directly with tear gas canisters at their bodies. Bethlehem: The clashes resulted in the injury of 2 civilians, including a child. One was hit with live bullets and the other was hit with rubber-coated metal bullets. Jericho: The clashes resulted in the injury of 11 civilians with rubber-coated metal bullets. Moreover, on 08 December 2017, Israeli forces stationed at Beit Eil Checkpoint, north of al-Bireh, opened fire at a young woman namely Asmaa’ Reidat and wounded her. As a result, she was hit with a bullet to the right leg and then arrested. She was taken via an Israeli ambulance to Hadassah Hospital in occupied Jerusalem. On 12 December 2017, Israeli soldiers opened fire at Hamed al-Masri (15) from Salfit and wounded him with a bullet to the head. They then arrested and took him to Beilinson and Hasharon Hospitals in Israel, and his condition was identified as serious. The Israeli forces claimed that the child intended to carry out a stab attack. However, the Israeli forces changed their claims saying that he was unarmed along with another child attempting to damage the security fence of “Arayel” settlement. They added that when an Israeli military force approached them, the child attempted to pull something out of his pocket. Therefore, the Israeli soldiers opened fire at him thinking he attempted to stab one of them. During the reporting period, Israeli forces conducted at least 80 military incursions into Palestinian communities in the West Bank while they conducted 9 incursions into Jerusalem and its suburbs. During those incursions, Israeli forces arrested at least 103 Palestinian civilians, including 6 children and 1 woman, in the West Bank. Forty-four of them, including 16 children, were arrested in Jerusalem and its suburbs. They also arrested 50 civilians, including 31 children, in the West Bank during protests against the U.S. President’s decision. Meanwhile, 38 civilians, including 14 children and 2 women, were arrested in Jerusalem on the same grounds. Thus, the number of arrestees in the West Bank and occupied Jerusalem rose to 271 civilians, including 67 children and 3 women. Among the arrestees was Sheikh Hasan Yousif, a Hamas Leader. At approximately 12:00 on Thursdays, 07 December 2017, Palestinian civilians organized a protest at the northern entrance to ‘Azzoun village, east of Qalqiliyah. The Israeli forces fired metal bullets, sound bombs and tear gas canisters. As a result, a 16-year-old child sustained a metal bullet that hit his right hand and fractured it. At approximately 13:00 on the same Thursday, a number of Palestinian youngsters gathered at the northern entrance to Yatta, south of Hebron. They set fire to tires at the intersection that leads to the Bypass Road (60). A number of Israeli military vehicles arrived at the intersection and completely closed it. The protestors threw stones and empty bottles at the soldiers. The soldiers chased the protestors amidst firing sound bombs and tear gas canisters. They also arrested ‘Ali (17) and his brother Ahmed Fares al-Shawahin (16). Around the same time, Palestinian civilians organized a protest at the eastern entrance to Kafer Qadoum village, northeast of Qalqiliyah. The Israeli forces fired metal bullets, sound bombs and tear gas canisters at the protestors. As a result, a 16-year-old child sustained a metal bullet wound to the left leg, and another civilian sustained a metal bullet wound to the right hand. At approximately 13:30, dozens of Palestinian civilians gathered at the vicinity of Howarah checkpoint, south of Nablus. They set fire to tires and put barricades on the street that leads to the abovementioned checkpoint. The protestors threw stones and empty bottles at the Israeli soldiers stationed at the checkpoint and behind cement cubes. The soldiers fired live and metal bullets and sound bombs at the protestors. As a result, 4 civilians sustained metal bullet wounds. The wounded civilians were transferred via an ambulance of the Palestine Red Crescent Society (PRCS) to Rafidiya Hospital in Nablus to receive medical treatment. Their wounds were classified as moderate. Around the same time, Palestinian civilians from the center of Ni’lin village, west of Ramallah, organized and made their way to the main entrance to the village. Israeli forces stationed there fired metal bullets, sound bombs and tear gas canisters at the protestors and chased them. They then arrested ‘Omer Talal Ahmed Sorour (17) and Badawi Emad Tantour (23) and heavily beat them. Around the same time, dozens of Palestinian young men from the center of Jericho organized a protest heading to the southern entrance to the city. The protestors threw stones and empty bottles at the Israeli forces stationed there. The Israeli forces fired live and metal bullets, sound bombs and tear gas canisters at them. 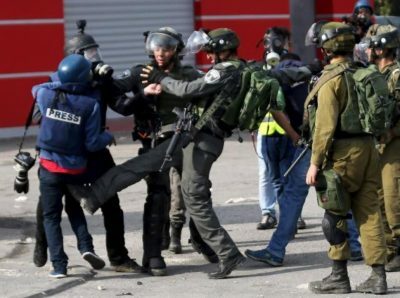 As a result, Omer Ibrahim Abu ‘Awad (30), a reporter at Palestine TV Channel, sustained a metal bullet wound to the right foot. Around the same time, hundreds of Palestinian civilians organized a protest at the northern entrance to al-Birah. They threw stones and empty bottles at Israeli soldiers stationed at al-Mahkamah checkpoint established near “Beit Eil” settlement, north of the city. When the protestors approached the abovementioned checkpoint, the soldiers fired live and metal bullets, sound bombs and tear gas canisters at them. As a result, 11 civilians were wounded. Three of them sustained live bullet wounds, 6 civilians sustained metal bullet wounds, and 2 civilians were hit with tear gas canisters. At approximately 14:00 on the same Thursday, dozens of Palestinian youngsters gathered at al-Sa’ah Intersection and al-Zawiyah Gate area in the center of Hebron. Large numbers of Israeli soldiers arrived at the area via the military checkpoint (56), which is established at the western entrance to al-Shuhada’a Street. The protestors set fire to tires and threw stones at the Israeli soldiers. The soldiers fired live and metal bullets and tear gas canisters at them. An Israeli force also chased the protestors, who withdrew to the entrance to Faisel Street. The soldiers arrested 8 civilians, including 7 children, and took them to the checkpoint area. The arrestees were identified as Mohammed Yunis al-Karki (16), Wadi’e Mohammed Adeeb Edwaik (34), Abdul Rahman ‘Ali Samir Amr (13), Wesam ‘Asem Salhab (17), Yusuf Hakam ‘Aabdin (15), Murad Faisel Abu Suneinah (16), Ahmad Ra’ed al-Tardah (14) and Mohammed Fawzi al-Junaidi (16). Around the same time, a number of Palestinian young men gathered on Beit ‘Ainun Road, east of Hebron. They threw stones and empty bottles at the Israeli forces, who deployed at the entrance. The soldiers fired sound bombs and tear gas canisters at the protestors and chased them. The soldiers also arrested Ahmed Mahmoud Faroukh (19) from Sa’ir village. At approximately 11:30 on Friday, 08 December 2017, dozens of Palestinian civilians gathered near the “Jishuri” Factories, west of Tulkarm. They set fire to tires and threw stones and empty bottles at the Israeli soldiers stationed in the area. The soldiers fired live and metal bullets and tear gas canisters at them. As a result, 8 civilians, including 3 children, were wounded. Five of them sustained live bullet wounds, 2 civilians sustained metal bullet wounds and one civilian was hit with shrapnel of a tear gas canister. At approximately 12:00 on Friday, 08 December 2017, Palestinian civilians organized a protest at the eastern entrance to Kafer Qaddoum village, northeast of Qalqiliyah. The Israeli forces fired metal bullets, sound bombs and tear gas canisters at the protestors. As a result, 9 civilians sustained metal bullet wounds. Among those wounded was Mahmoud Fawzi, a photojournalist at Ramasat Media Company. Mohammed sustained a metal bullet wound to the neck. Around the same time, Palestinian civilians organized a protest at the northern entrance to ‘Azzoun village, east of Qalqiliyah. Israeli forces fired metal bullets, sound bombs and tear gas canisters at the protestors. As a result, 3 civilians were wounded. One of them sustained a metal bullet wound to the left ear, and the other two were hit with tear gas canisters. Around the same time, Palestinian civilians organized a protest at the annexation wall gate, west of Joyous village, northeast of Qalqiliyah. Israeli forces fired metal bullets, sound bombs and tear gas canisters at the protestors. As a result, a 17-year-old child sustained a live bullet wound to the right knee, and a 21-year-old civilian sustained a live bullet wound to the left leg. At approximately 12:45, Palestinian civilians organized a protest near Jaljulyah checkpoint, west of Qalqiliyah. Israeli forces fired metal bullets, sound bombs and tear gas canisters at the protestors. As a result, a civilian was hit with a tear gas canister to the head. The Israeli forces also arrested Khalil Ibrahim al-Aqra’a (14), Anas Saqer al-Aqra’a (18), and Mohammed Jamal Hassan (18). All of them from Qalqiliyah. Following the same Friday prayer, dozens of Palestinian civilians gathered in the vicinity of Howarah checkpoint, south of Nablus. They set fire to tires and put barricades on the street, which leads to the abovementioned checkpoint. The protestors also threw stones and empty bottles at Israeli soldiers stationed at the checkpoint and behind cement cubes. The soldiers fired live and metal bullets and sound bombs at the protestors. As a result, 7 civilians, including a child, sustained metal bullet wounds. The wounded were transferred via a PRCS ambulance to Rafidiya Hospital in Nablus to receive medical treatment. Their wounds were classified as moderate. Following the same Friday prayer, Palestinian civilians organized a protest from Jenin and made their way to al-Jalmah checkpoint, northeast of Jenin. They threw stones and empty bottles at the Israeli soldiers stationed at the abovementioned checkpoint. The soldiers fired live and metal bullets and tear gas canisters at the protestors. The Israeli forces also set an ambush for Palestinian farmers in greenhouses that are next to the checkpoint and then arrested 6 civilians, including 2 children, namely Ahmed Amjad ‘Esam ‘Assaf (15), Fou’ad Ibrahim Husam Hejazi (21), Abdul ‘Aziz Omer Abdul Wahhab Senan (22), from Jenin, Methqal Nidal Saleh Abu Ghalyoun (17), from Jenin refugee camp, and Na’el Mahmoud Husain ‘Asa’asah (22) from Muthalath al-Shuhada’a village, south of Jenin. Around the same time, Palestinian civilians organized a protest from al-‘Aroub refugee camp, north of Hebron, and made their way to the western entrance to the camp. The protestors threw stones at Israeli soldiers stationed behind military vehicles. The soldiers fired sound bombs and tear gas canisters at the stone-throwers and nearby houses. The young men withdrew to the camp while large groups of the Israeli forces chased them. As a result, 4 civilians, including 3 children, sustained live bullet wounds to lower limbs of their bodies. Around the same time, Palestinian civilians organized a protest in front of al-Husain Ben ‘Ali Mosque on ‘Ein Sarah Street in Hebron. They made their way to Ben Rushed Intersection in the PA controlled area classified as (H1). Several military vehicles had arrived at the area and the soldiers deployed between shops. The soldiers then fired sound bombs and tear gas canisters at the participants and chased them. The Israeli forces also arrested 11 civilians, including 4 children. Around the same time, dozens of Palestinian young men organized a protest in Halhoul, north of Hebron at al-Hawawer Intersection, which leads to the Bypass Road (60). The young men threw stones at the Israeli military vehicles, so the soldiers chased them. The Israeli forces arrested Rashed Maher Mohammed Ramadan (17) and Fou’ad Sami al-Se’dah (17). Following the same Friday prayer, Palestinian civilians organized a protest from the Grand Mosque in the center of Beit Ummer village, north of Hebron. They made their way to the eastern entrance to the village, which is connected with the Bypass Road (60) where an Israeli military watchtower is established. When the protestors arrived at ‘Asidah area, large Israeli forces had deployed at the area and between houses. They also closed the road with military vehicles. When the protestors were about 300 meters away from the watchtower, a soldier fired a tear gas canister at them. The protestors threw stones at the soldiers, who immediately fired lived and metal bullets and tear gas canisters at them. As a result, a 20-year-old civilian sustained a live bullet wound to the right thigh. Around the same time, Palestinian civilians organized a protest in the vicinity of “Jishuri”Factories, west of Tulkarm. Israeli forces fired metal bullets, sound bombs and tear gas canisters at the protestors. As a result, 8 civilians, including 3 children, were wounded. Five of them sustained live bullet wounds, 2 civilians sustained metal bullet wounds and a civilian was hit with a tear gas canister. Around the same time, dozens of Palestinian youngsters organized a protest from the center of Jericho and made their way to the southern entrance to the city. When the participants approached the abovementioned entrance, they threw stones and empty bottles at the Israeli forces stationed there. The soldiers fired live and metal bullets, sound bombs and tear gas canisters at them. As a result, 9 civilians sustained metal bullet wounds to the lower limbs of their bodies. Moreover, ‘Adel Abu Ne’mah, a reporter at Reuters News Agency, was directly hit with a tear gas canister to the chest while on duty. Following the same Friday prayer, dozens of Palestinian civilians, international human rights’ defenders and Israelis organized protests from Ni’lin and Bil’in, Badras and al-Janiyah villages, west of Ramallah, and al-Nabi Saleh village, northwest of the city. Israeli forces used force to disperse the protestors by firing live and metal bullets, sound bombs and tear gas canisters at them. As a result, a civilian, from Bil’in village, and a 17-year-old civilian, from Budrus village, were wounded. Moreover, two civilians, including a child, from al-Nabi Saleh village, and a civilian, from al-Janiyah village, were wounded. All of them sustained wounds to the lower limbs to their bodies. ‘Ali Dar ‘Ali, a reporter at Palestine TV Channel. It should be noted that the Feras, Khalid and Nisreen suffered tear gas inhalation while ‘Ali sustained 2 live bullet wounds to the head and hand. At approximately 13:30 on Saturday, 09 December 2017, hundreds of Palestinian civilians organized a protest at the northern entrance to al-Birah. They threw stones and empty bottles at Israeli soldiers stationed at al-Mahkamah Checkpoint, which is established near “Beit Eil” settlement, north of the city. 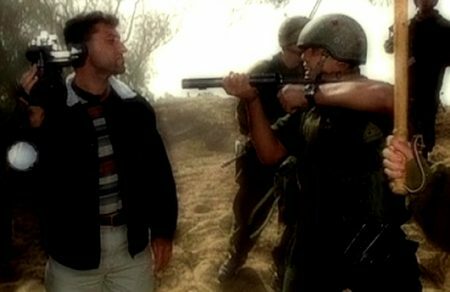 When the protestors approached the abovementioned checkpoint, the soldiers fired live and metal bullets, sound bombs and tear gas canisters at them. As a result, 17 civilians were wounded. Eleven of them sustained metal bullet wounds, and 6 civilians were hit with tear gas canisters. At approximately 14:00 on Saturday, 09 December 2017, dozens of Palestinian youngsters gathered on al-Shalalah Street in the center of Hebron. An Israeli infantry unit moved into the Abovementioned Street, fired sound bombs and tear gas canisters at the young men and chased them into Abu al-Hems Road and al-Tuffah Valley Street. The soldiers also fired sound bombs at the journalists who were in the area. As a result, ‘Aref Mohammed Omer Jaber (43), a volunteer at B’Tselem-the Israeli Information Center for Human Rights, was hit with a sound bomb to the right foot. He was transferred to the Governmental Hospital in the city, and his injury was classified as minor. At approximately 10:10 on Sunday, 10 December 2017, upon a call by the Students’ Union in Khadouri University, west of Tulkarm, about 400 students made their way to the point of confrontation adjacent to Netanya Gate (104). They threw stones at the Israeli soldiers stationed there. The Israeli forces sprayed waste water and fired live and metal bullets, sound bombs and tear gas canisters at the civilians. As a result, 4 civilians, including a child, were wounded. Three of them sustained live bullet wounds to the lower limbs of their bodies, and the child was hit with a tear gas canister to the head. At approximately 11:00 on Sunday, 10 December 2017, dozens of Palestinian youngsters gathered in al-Zawiyah Gate area and at al-Sa’ah Intersection in the center of the city. An Israeli infantry unit moved into the Abovementioned Street and fired sound bombs and tear gas canisters. They also arrested Islam Fadel Mohammed al-Shuweiki (17) and Mohammed Eshaq Mohammed Dababsah (22). At approximately 12:10 on the same Sunday, dozens of Palestinian civilians protested near the northern entrance to Salfit. Israeli forces fired metal bullets, sound bombs and tear gas canisters at the protestors. As a result, 4 civilians sustained wounds to the lower limbs of their bodies. Among the wounded was Ahmed ‘Adnan Ibrahim Shater (23), a reporter at al-Zaytunah Radio from Kafel Hares village, who sustained 2 live bullet wounds to his feet. On the afternoon hours, a number of Palestinian youngsters gathered in the vicinity of Bilal Ben Rabah Mosque known as “Rachel Tomb” at the northern entrance to Bethlehem. They threw stones and Molotov Cocktails at the Israeli soldiers, who fired live and metal bullets at them. As a result, a 16-year-old child, from al-Duheishah refugee camp, sustained 3 live bullet wounds to the foot, and a young man sustained a metal bullet wound. They were transferred to al-Husain Hospital in Beit Jala to receive medical treatment. The Israeli forces arrested 3 children namely Husain Khader Ibrahim Masalmah (12) Oseid Eden Abu Sha’ir (13) and Abdul Ra’ouf Anwar Bal’awi (12). At approximately 14:00, Palestinian students from Palestine Technical College in al-‘Aroub area organized a protest to the Bypass Road (60). When the protestors moved about 100 meters into the college, Israeli forces raided the college and al-‘Aroub Agricultural School and fired sound bombs and tear gas canisters at the students. As a result, a 22-year-old civilian sustained live bullet shrapnel to the abdomen and head. He was transferred to a hospital, and his injury was classified as moderate. At approximately 14:30, dozens of Palestinian students gathered in the vicinity of Beit Kahel schools, north of Hebron. Israeli forces moved into the abovementioned village amidst firing tear gas canisters at the students and protestors and chased them. The soldiers then arrested 5 civilians namely Omer Abdul Rahman Shehdah Zohour (16), Omer Khalil Ahmed al-Zuhour (14), Yazan Hatem al-‘Asafrah (14), Farouq Sami ‘Asafrah (14) and Mohammed Mahmoud Baryoush (14). At approximately 10:00 on Monday, 11 December 2017, about 200 civilians gathered in the vicinity of “Jishuri” Factories, west of Tulkarm. They set fire to tires and threw stones at the Israeli soldiers stationed in the area. The soldiers fired live and metal bullets and sound bombs at them. As a result, 5 civilians, including a child, were wounded. Four of them sustained live bullet wounds, and the other civilian was hit with a tear gas canister to the hand and so was amputated. He carried the tear gas canister in his hand and so it blew up. At approximately 13:30, on the same Monday, dozens of Palestinian civilians protested at the northern entrance to Yatta “Zeif”, south of Hebron. Israeli forces fired metal bullets, sound bombs and tear gas canisters at the protestors and chased them. Israeli forces also arrested Mohammed ‘Awad Bahis (13) and Mohammed Yahiya Makhamrah (14) and took them to “Kiryat Arba” settlement, east of Hebron. Around the same time, hundreds of Palestinian civilians organized a protest at the northern entrance to al-Birah. They threw stones and empty bottles at Israeli soldiers stationed at al-Mahkamah Checkpoint, established near “Beit Eil” settlement, north of the city. When the protestors approached the abovementioned checkpoint, the soldiers fired live and metal bullets, sound bombs and tear gas canisters at them. As a result, 6 civilians, including a child, were wounded. Six of them sustained metal bullet wounds and 2 others were hit with tear gas canisters. Among those wounded was photojournalist Nasser al-Shuyokhi, who sustained a metal bullet wound to the shoulder. At approximately 14:00, dozens of Palestinian youngsters gathered in al-Zawiyah Gate area in the center of Hebron. An Israeli infantry unit moved into the Abovementioned Street. They heavily fired sound bombs and tear gas canisters at the protestors and chased them. As a result, a 19-year-old civilian sustained a live bullet wound to the right leg. Israeli forces also arrested Nezar Senan Abdullah Hamedat (17). At approximately 15:00 on the same Monday, dozens of Palestinian youngsters protested in al-Naqqar neighborhood, which is adjacent to the annexation wall, west of Qalqiliyah. Israeli forces fired metal bullets, sound bombs and tear gas canisters at them. 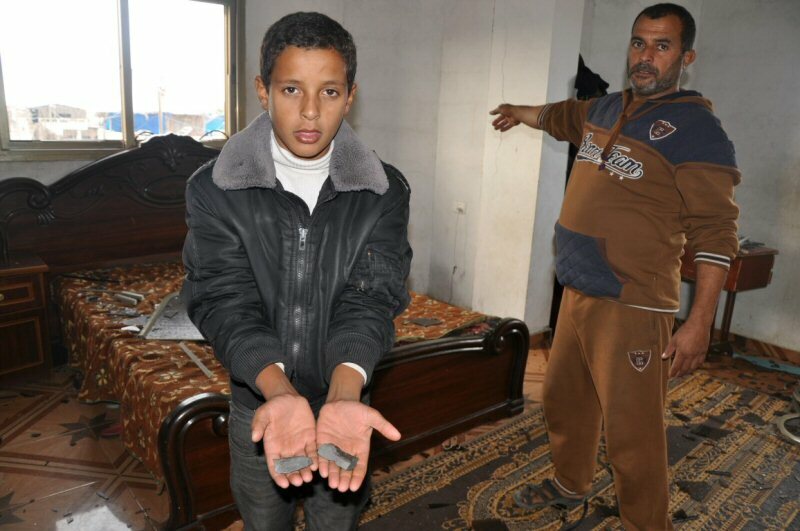 As a result, a 13-year-old child sustained a metal bullet wound to the right hand, and another civilian’s hand was amputated after he was hit with a tear gas canister to his right hand. The civilian underwent a surgery in Dr. Darwish Nazzal Hospital in the city. At approximately 11:00 on Tuesday, 12 December 2017, about 170 Palestinian civilians organized a protest in the vicinity of “Jishuri” Factories, west of Tulkarm. Israeli forces fired metal bullets, sound bombs and tear gas canisters at the protestors. As a result, 2 civilians sustained metal bullet wounds. At approximately 10:00 on Wednesday, 13 December 2017, Palestinian civilians organized a protest in the vicinity of “Jishuri” Factories, west of Tulkarm. Israeli forces fired metal bullets, sound bombs and tear gas canisters at the protestors. As a result, 4 civilians were wounded. Moreover, Mahmoud Fawzi, photojournalist at Ramasat Media Company, sustained a metal bullet wound to the back. At approximately 11:00 on the same Wednesday, dozens of Palestinian civilians organized a protest in the center of Beit Ummer village, north of Hebron. They made their way to the village entrance that leads to the Bypass Road (60). When the protestors approached the ‘Asidah area, which is about 300 meters away from the village entrance. An Israeli force deployed between houses and topped some of their roofs. They also closed the main road that leads to the entrance with military vehicles. The soldiers then fired live and metal bullets, sound bombs and tear gas canisters at the protestors. As a result, 3 civilians, including 2 children, were wounded. Two of them sustained live bullet wounds to the lower limbs of their bodies, and the third was hit with a tear gas canister. At approximately 10:30 on the same Wednesday, school students along with their parents and National Factions organized a protest in the center of Hahoul, north of Hebron. When they arrived near Halhoul Police Station, an Israeli force accompanied with several military vehicles attacked the protestors. The soldiers stepped out of the vehicles and heavily fired tear gas canisters at them. A number of youngsters threw stones at the soldiers stationed between shops on al-Bas Street. The soldiers fired metal bullets, sound bombs and tear gas canisters at them. The Israeli forces detained 2 PRCS ambulances and arrested 2 female students, who suffered tear gas inhalation. The arrestees were identified as Manar Khdair Abu Rayyah (17) and Asalah Zuhair abu Rayan (17). Israeli forces also arrested Monther Mohammed al-Atrash (22). Moreover, 2 young men sustained metal bullet wounds. At approximately 13:00, hundreds of Palestinian civilians organized a protest at the northern entrance to al-Birah. They threw stones and empty bottles at Israeli soldiers stationed at al-Mahkamah Checkpoint established near “Beit Eil” settlement, north of the city. When the protestors approached the abovementioned checkpoint, the Israeli soldiers fired metal bullets, sound bombs and tear gas canisters at them. As a result, 7 civilians, including 2 children, sustained metal bullet wounds. At approximately 13:30 on Thursday, 07 December 2017, dozens of Palestinian youngsters gathered few meters away from the border fence between the Gaza Strip and Israel, east of Khan Yunis in the southern Gaza Strip. Some of the participants set fire to tires and threw stones at the soldiers stationed along the border fence while a number of them approached the abovementioned border fence and fixed the Palestinian flags to the fence. After few hours of confrontations, Israeli soldiers sporadically fired live and metal bullets and tear gas canisters at the protestors. As a result 6 civilians, including a child, were wounded. Three civilians sustained 3 live bullet wounds and 3 others were directly hit with tear gas canisters. They were transferred to Gaza European Hospital in Khan Yunis. Their health condition ranged between moderate and minor. Moreover, a PRCS ambulance was targeted with tear gas canisters while it was on “Jakar” Street, east of the area. At approximately 14:30 on the same Thursday, dozens of Palestinian youngsters made their way to the border fence between the Gaza Strip and Israel, east of al-Shuhada’a Cemetery, east of Jabalia in the northern Gaza Strip. The youngsters approached the security fence and threw stones at the Israeli soldiers along the border fence. The soldiers fired live bullets, rubber-coated metal bullets, and tear gas canisters at the protestors. As a result, a 22-year-old civilian sustained a live bullet wound to the right knee and fractured it, and a 16-year-old child was directly hit with a tear gas canister to the pelvis. They were transferred by a PRCS ambulance to the Indonesian Hospital. The first civilian’s injury was classified as moderate and the second’s injury was classified as minor. At approximately 13:00 on Friday, 08 December 2017, dozens of Palestinian young men gathered few meters away from the border fence between the Gaza Strip and Israel, east of Khan Yunis in the southern Gaza Strip. A number of them set fire to tires and threw stones at the Israeli forces stationed along the border fence. Moreover, a number of them approached the abovementioned border fence and fixed Palestinian flags to it. After few hours of confrontations, Israeli soldiers sporadically fired live and metal bullet and tear gas canisters at the protestors. As a result, Mahmoud Abdul Majid al-Masri (29) was killed an hour after he sustained a live bullet wound to the right thigh when he was in the east of ‘Abasan al-Kabirah. Mahmoud was transferred to Gaza European Hospital where he succumbed to his wounds. According to eyewitnesses’ accounts to PCHR’s fieldworker, the Israeli forces heavily fired tear gas canisters at young men, who attempted to rescue Mohammed and move him away after his injury. As a result, Mohammed was hit with a tear gas canister to the back and 3 other young men were directly hit with tear gas canisters and metal bullets. Therefore, Mohammed was transferred to the hospital after more than 15 minutes and bled a lot. Moreover, 33 civilians, including 6 children were wounded. Thirteen of them sustained live bullet wounds, 4 civilians sustained metal bullet wounds, and 16 civilians were directly hit with tear gas canisters. Furthermore, 2 ambulances were targeted with tear gas canisters. Around the same time, dozens of Palestinian civilians gathered in the vicinity of al-Shuja’iyah neighborhood, east of Gaza city. They made their way to the border fence between the Gaza Strip and Israel (near former Nahal Oz Crossing). The protestors threw stones at the Israeli soldier stationed along the border fence. The soldiers fired live bullets, rubber-coated metal bullets and tear gas canisters. As a result, 31 civilians were wounded. Ten of them sustained live bullet wounds, 3 civilians sustained metal bullet wounds, and 18 civilians were directly hit with metal bullet wounds. The wounded civilians were transferred via ambulances to al-Shifa Hospital in Gaza city. Medical sources classified 2 civilians’ injuries as serious. At approximately 13:30 on the same Friday, dozens of Palestinian youngsters made their way to the border fence between the Gaza Strip and Israel, east of al-Shuhada’a Cemetery, east of Jabalia in the northern Gaza Strip. The youngsters approached the security fence and threw stones at the Israeli soldiers stationed along the border fence. The soldiers fired live bullets, rubber-coated metal bullets, and tear gas canisters at the protestors. As a result, 62 civilians, including 11 children, sustained wounds. Twenty two of them sustained live bullet wounds, 2 civilians sustained metal bullet wounds, and 38 civilians were directly hit with tear gas canisters. The wounded civilians were transferred via ambulances of PRCS, Military Health Services and the Ministry of Health to the Indonesian Hospital and al-‘Awdah Hospital in Jabalia. Medical sources classified 3 civilian’s injuries as serious while the other injuries were between minor and moderate. 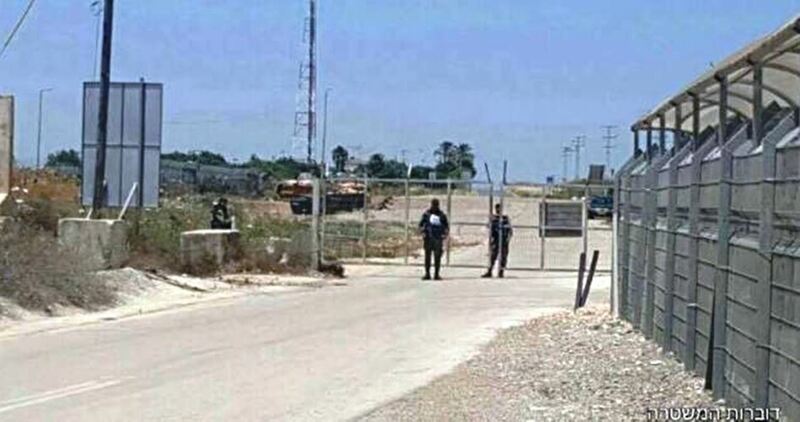 At approximately 16:00, Israeli forces stationed at Beit Hanoun “Erez” crossing, northwest if Beit Hanoun in the northern Gaza Strip, arrested Khalid Mohammed Hamdi Takunah (25) from Beit Lahia housing project, during the clashes that erupted at the crossing and its vicinity. He was released at approximately 23:00 on the same day. Khalid’s family took him to the Indonesian Hospital in Jabalia. Medical examinations showed that he sustained bruises throughout his body after the Israeli soldiers attacked him. It should be noted that Khalid suffers from mental disorders. Around the same time, hundreds of Palestinian youngsters made their way to the border fence between the Gaza Strip and Israel, east of al-Buraij refugee camp in the central Gaza Strip. The protestor set fire to tires and threw stones at the Israeli soldiers stationed behind sand barriers along the border fence. The soldiers fired live bullets and tear gas canisters at the protestors. As a result, 10 civilians, including 2 children, were wounded. They were transferred to al-Aqsa Hospital in Deir al-Balah. Nine of them sustained live bullet wounds and one civilian was hit with a tear gas canister to the face and burnt it. At approximately 14:00, hundreds of Palestinian youngsters gathered few meters from the border fence between the Gaza Strip and Israel, east of al-Shawkah village, east of Rafah in the southern Gaza Strip. A number of them approached the border fence, set fire to tires, raised flags and banners and threw stones at the Israeli forces stationed along the abovementioned border. The soldiers fired live bullets and tear gas canisters at the protestors. The clashes continued until approximately 17:00 on the same day. As a result, 5 civilians sustained live bullet wounds to the lower limbs of their bodies. At approximately 10:00 on Saturday, 09 December 2017, dozens of Palestinian youngsters made their way to the border fence between the Gaza Strip and Israel, east of Khuza’ah village, east of Khan Yunis in the southern Gaza Strip. A number of them set fire to tires, threw stones at the Israeli forces stationed along the border fence and raised flags at the border fence. Over several hours of confrontations, the Israeli soldiers fired live and metal bullets and tear gas canisters at the protestors. As a result, 4 civilians, including a child and a woman, were wounded. Two of them sustained live bullet wounds and the two others sustained metal bullet wounds. The woman was hit with a stray bullet to the right shoulder while she was on her house roof, which is about 3 kilometers away from the abovementioned border fence. On Saturday morning and evening hours, dozens of Palestinian youngsters made their way to the border fence between the Gaza Strip and Israel, from several areas, north of the Gaza Strip. They approached the security fence and threw stones at the Israeli soldiers stationed along the border fence. The soldiers fired live bullets, rubber-coated metal bullets and tear gas canisters at them. As a result, 8 civilians, including 2 children, were wounded. Three of them sustained live bullet wounds and 5 civilians were directly hit with tear gas canisters. Talal Marwan Ahmed Huweihi (22), a journalist at al-Quds Radio from Beit Hanoun, suffered tear gas inhalation, and Ibrahim Nasser Husain Abu Marasa (26), a reporter at al-Watan Radio from Beit Lahia housing project, suffered tear gas inhalation. At approximately 13:00 on the same Saturday, dozens of Palestinian civilians gathered in the vicinity of the border fence between the Gaza Strip and Israel, east of al-Sheja’eya neighborhood, east of Gaza city. The protestors threw stones at the Israeli soldiers stationed along the border fence. The soldiers fired live bullets, rubber-coated metal bullets and tear gas canisters at the protestors. As a result, 8 civilians were wounded. Seven of them sustained live bullet wounds and one civilian was directly hit with a tear gas canister. The wounded civilians were transferred via ambulances to al-Shifa Hospital in Gaza city. Medical sources classified the injuries between minor and moderate. At approximately 15:00, dozens of Palestinian civilians organized a protest in front of the border fence area between the Gaza Strip and Israel, east of al-Shawkah village, east of Rafah in the southern Gaza Strip. Israeli forces fired metal bullets, sound bombs and tear gas canisters at them. As a result, a civilian was hit with a tear gas canister to the head. At approximately 12:00 on Sunday, 10 December 2017, dozens of Palestinian civilians organized a protest in front of the border fence area between the Gaza Strip and Israel, east of Khuza’ah and ‘Abasan al-Kabirah, east of Khan Yunis, in the southern Gaza Strip. Israeli forces fired metal bullets, sound bombs and tear gas canisters at the protestors. As a result, 7 civilians, including 4 children, were wounded. One of them sustained a live bullet wound, 4 civilians sustained metal bullet wounds and 2 civilians were hit with tear gas canisters. At approximately 13:00 on the same Sunday, dozens of Palestinian youngsters made their way to the border fence between the Gaza Strip and Israel, east of al-Shuhada’a Islamic Cemetery, east of Jabalia in the northern Gaza Strip. The youngsters approached the security fence and threw stones at the Israeli soldiers stationed along the border fence. The soldiers fired live bullets, rubber-coated metal bullets and tear gas canisters. As a result, a 22-year-old civilian sustained a live bullet wound to the right leg and penetrated the left leg causing bone laceration. He was transferred via a PRCS ambulance to the Indonesian Hospital, and his injury was classified as serious. Around the same time, dozens of Palestinian civilians protest in the vicinity of the border fence between the Gaza Strip and Israel, east of al-Sheja’eya neighborhood, east of Gaza city. Israeli forces fired live bullets, rubber-coated metal bullets and tear gas canisters at the; as a result, 2 civilians were directly hit with tear gas canisters on their bodies. At approximately14:00 on the same Sunday, dozens of Palestinian civilians protested near of the border fence between the Gaza Strip and Israel, east of al-Buraij refugee camp in the central Gaza Strip. Israeli forces fired metal bullets, sound bombs and tear gas canisters at the protestors. As a result, a 22-year-old civilian was hit with a live bullet that entered the left leg and exited the right foot. He was transferred to al-Aqsa Hospital in Deir al-Balah. His injury was classified as moderate. Around the same time, dozens of Palestinian civilians protested near of the border fence between the Gaza Strip and Israel, east of al-Shawkah village, east of Rafah in the southern Gaza Strip. Israeli forces fired metal bullets, sound bombs and tear gas canisters at the protestors. As a result, a 16-year-old civilian sustained a metal bullet wound to the face. At approximately 11:00 on Monday, 11 December 2017, dozens of Palestinian civilians protested near the border fence between the Gaza Strip and Israel, northwest of Beit Hanoun, east of Jabalia in the northern Gaza Strip. Israeli forces fired metal bullets, sound bombs and tear gas canisters at them. As a result, 17 civilians, including 6 children, were wounded. Nine of them sustained lived bullet wounds, 6 civilians were directly hit with tear gas canisters, and 2 civilians sustained metal bullet wounds. At approximately 13:00 on Monday, 11 December 2017, dozens of Palestinian civilians protested in the vicinity of the border fence between the Gaza Strip and Israel, east of al-Sheja’eya neighborhood, east of Gaza city. Israeli soldiers fired live bullets, rubber-coated metal bullets and tear gas canisters at them. As a result, 7 civilians sustained live bullet wounds. At approximately 14:00 on Monday, 11 December 2017, dozens of Palestinian civilians protested in front of the border fence between the Gaza Strip and Israel, east of al-Shawkah village, east of Rafah in the southern Gaza Strip. Israeli forces fired metal bullet, sound bombs and tear gas canisters at the protestors. As a result, a 29-year-old civilian sustained a live bullet wound to the left hand. Around the same time, dozens of Palestinians protested near the border fence between the Gaza Strip and Israel, east of al-Buraij refugee camp in the central Gaza Strip. Israeli forces fired metal bullets, sound bombs and tear gas canisters. As a result, a 22-year-old civilian sustained a live bullet wound to the right thigh. He was transferred to al-Aqsa Hospital in Deir al-Balah. His injuries were classified as moderate. Around the same time, dozens of Palestinians protested in front of the border fence area, east of Khuza’ah and ‘Abasan al-Kabirah villages, east of Khan Yunis. Israeli forces fired metal bullets, sound bombs and tear gas canisters at them. As a result, 6 civilians, including 3 children, were wounded. Four of them sustained live bullet wounds, one civilian sustained a metal bullet wound, and one civilian was hit with a tear gas canister to his body. At approximately 11:00 on Tuesday, 12 December 2017, dozens of Palestinian civilians protested near the border fence area in the vicinity of a landfill, north of the Agriculture School, north of Beit Hanoun in the northern Gaza Strip. Israeli forces fired metal bullets, sound bombs and tear gas canisters at the protestors. As a result, a 17-year-old civilian was hit with a live bullet that entered and exited the right leg. He was taken via a civilian car to Beit Hanoun Governmental Hospital and then referred to the Indonesian Hospital. After doctors examined his medical condition, they found that he suffers from severe bleeding due to a vein cut in his leg. He was then referred to al-Shifa Hospital in Gaza city. Medical sources classified his injury as moderate. In the evening hours, another civilian sustained a live bullet wound to the left leg. At approximately 13:00 on Tuesday, 12 December 2017, dozens of Palestinian civilians protested in the vicinity of the border fence between the Gaza Strip and Israel, east of al-Sheja’eya neighborhood, east of Gaza city. Israeli soldiers fired live bullets, rubber-coated metal bullets and tear gas canisters at them. As a result, 10 civilians were wounded. One of them sustained a live bullet wound, 2 civilians sustained metal bullet wounds, and 7 civilians were directly hit with tear gas canisters. At approximately 14:00 on the same Tuesday, dozens of Palestinian civilians protested in the border fence area, east of al-Shawkah village, east of Rafah in the southern Gaza Strip. Israeli forces fired metal bullets, sound bombs and tear gas canisters at them. As a result, 3 civilians, including a child, sustained live bullet wounds to the lower limbs of their bodies. At approximately 14:00 on the same Tuesday, dozens of Palestinian civilians protested in the border fence area, east of Khuza’ah and ‘Abasan al-Kabirah villages, east of Khan Yunis. Israeli forces fired metal bullets, sound bombs and tear gas canisters at them. As a result, 6 civilians were wounded. Two of them sustained live bullet wounds and the third sustained a metal bullet wound. At approximately 13:00 on Wednesday, 13 December 2017, dozens of Palestinian civilians protested in the border fence area, east of Khuza’ah and ‘Abasan al-Kabirah villages, east of Khan Yunis. Israeli forces fired metal bullets, sound bombs and tear gas canisters at them. As a result, 6 civilians, including a child, were wounded. Four of them sustained live bullet wounds and 2 civilians sustained metal bullet wounds. Around the same time, dozens of Palestinian civilians protested in the border fence area, northwest of Beit Hanoun, east of Jabalia in the northern Gaza Strip. Israeli forces fire metal bullets, sound bombs and tear gas canisters at them. As a result, 4 civilians, including a child, were wounded. Two of them sustained live bullet wound and the two other were directly hit with tear gas canisters. At approximately 14:00 on Wednesday, 13 December 2017, dozens of Palestinians protested in the border fence area, east of al-Shawkah village, east of Rafah in the southern Gaza Strip. Israeli forces fired metal bullet, sound bombs and tear gas canisters at the protestors. As a result, a 20-year-old civilian sustained a live bullet wound to the left leg. Around the same time, dozens of Palestinian civilians protested in the border fence area, east of al-Buraij refugee camp in the central Gaza Strip. Israeli forces fired metal bullets, sound bombs and tear gas canister at them. As a result, a 30-year-old civilian sustained 2 live bullet wounds at the right thigh and hand. He was transferred to al-Aqsa hospital in Deir al-Balah and his injury was classified as moderate. At approximately 12:30 on Thursday, 07 December 2017, Israeli forces moved into al-Issawiyah village, northeast of occupied Jerusalem. They raided and searched dozens of houses, from which they arrested (10) civilians, including (5) children. Israeli forces later withdrew taking the arrestees with them. Those arrestees were identified as, Mohammed Anas Dari (14); Ameer Gharib; Mohammed al-Kaswani (18); Ahmed Derbas (14); Yazen Jaber (19); Fayez Moheisen (18); Mohamed Ayman Ubeid (19); Anas Ali Abu Assab (17); Laith Mahmoud (14); Adam Mustafa (15). At approximately 01:00, on Friday, 08 December 2017, Israeli forces moved into the Old City of occupied East Jerusalem. They raided and searched dozens of houses, from which they arrested (4) civilians. The civilians were identified as, Maged Ragheb al- Ja’ba (23); Jehad Naser Qus (24); Rawhi Mohammad al-Kalghasi (22); Hamza Melhis (19). At approximately 02:00, Israeli forces moved into Ras al-‘Amoud neighborhood, east of occupied Jerusalem. They raided and searched a house belonging to the family of Oday Rebhi Sa’ad Addin Sunnokrot (24). They arrested the abovementioned civilian and later withdrew taking him to an unknown destination. At approximately 02:30, Israeli forces moved into al-Tour Mount, east of occupied Jerusalem. They raided and searched a house belonging to the family of Mustafa Raed al-Hashlamon (20). The Israeli forces arrested the aforementioned civilian and later withdrew taking him to an unknown destination. At approximately 03:00, on Friday, Israeli forces moved into Wadi al-Joz, in occupied East Jerusalem. They raided and searched a number of houses, from which they arrested Noor Salem Shalabi (19) and Mohammad Abu Shusha (20). The Israeli forces later withdrew taking them to an unknown destination. At approximately 00:00 on Tuesday, 12 December 2017, Israeli forces moved into Sho’fat refugee camp, north of occupied Jerusalem. They raided and searched houses from which they arrested ‘Amar Abu al-Sa’d (34), Zaki Mohamed Ali (29) and Nizar Mohamed Ali (27). At approximately 03:00, Israeli forces moved into Silwan village, south of occupied Jerusalem’s Old City. They raided and searched a house belonging to Basil Mohamed Doweek (17) and arrested him. At approximately 14:00 on Monday, 11 December 2017, Israeli forces arrested 3 children while returning from the school in Ras al-‘Amoud area, east of occupied East Jerusalem’s Old City, and then took them to an investigation center. The arrested persons were identified as Jihad Qwider (15), Mahmoud Shehadah (13), and Ahmed Khalifah (14). At approximately 02:00 on Wednesday, 13 December 2017, Israeli forces moved into al-‘Issawiyia village, northeast of occupied Jerusalem. They raided and searched dozens houses from which they arrested 18 civilians, including 6 children. PCHR keeps the names of the arrested persons. At approximately 07:00 on Wednesay, Israeli forces arrested Mohanad Wael Da’nah (16) while heading to the school in Silwan village, south of occupied Jerusalem. At approximately 09:00 on Sunday, 10 December 2017, Israel Nature and Parks Authority uprooted and cut trees in Bab al-Rahma Cemetery adjacent to the eastern wall of Al-Aqsa Mosque in the Old City of occupied East Jerusalem. During this, they arrested the Secretary of Fatah Movement in Silwan, Ahmad al-‘Abasi, and Khaled Al-Zir. According to PCHR’s investigations and what eyewitnesses said, Israeli forces moved into the Cemetery accompanied by a staff from the Israel Nature and Parks Authority and started to uproot and cut trees in an area known as “al-Salawna Cemetery”, claiming to be doing cleaning work, in addition to establishing a fence around the area. The families attempted to prevent them from cutting the trees in the Cemetery and clutched the trees. However, the Israeli forces forcibly distanced them, assaulted others by pushing them, and arrested al-‘Abasi and Al-Zir. It should be mentioned that several areas in Bab al-Rahmah are threatened of confiscation for the interest of establishing tracks for the “Talmud Gardens and tourists”. Israel Nature and Parks Authority has several times tried to tamper with cemeteries, put barbed wires, and ban burying in some limbs of them, preparing to confiscate them. In addition, the Authority hinders the work of families when they do the cleaning works in the cemetery. On Thursday, 07 December 2017, Israeli forces used force to disperse a demonstration organized by dozens of Palestinians at Bab al-‘Amoud (Damascus Gate) area and streets around it in East Jerusalem protesting the decision of the U.S. President Donald Trump to recognize Jerusalem as the Capital of Israel. The protest continued until the evening when Israeli Special Forces and mounted police officers attempted to forcibly suppress the protestors several times by beating and pushing them. They also closed the area with iron barriers. At approximately 16:30, the soldiers evacuated the area after they attacked the protestors and moved them away. After that, the protestors then moved to the “American House” in the city and put Palestinian Kufiyah and flag on the gates, but the Israeli police immediately removed the flag and moved the protestors away from the gate. During the protest, the Israeli forces attacked the journalists and ambulance crews in Bab al-‘Amoud area. They also attacked a group of elderly men and women and beat a young man, who already suffered a fractured foot and walks with a crutch. Moreover, the Israeli forces arrested 7 civilians, including 5 children, namely Mustafa Khuwais (12), Mohammed al-Saleimah (12), Omer Abu Ermilah (19), Mahmoud al-Shawish (17), Abdul Rahman Abu ‘Omeir (16), Monther al-Junaidi (19), and Majd Nader Sa’edah (17). Following Friday prayer on 08 December 2017, Palestinians organized a demosnrtation and made their way from the yard of al-Qibli Mosque to the Dome of the Rock during which they raised Palestinian flags and chanted slogans for Jerusalem and al-Aqsa Mosque. Dozens of Turkish people participated in the protest and raised the Turkish and Palestinian flags. The protestors headed to Bab al-‘Amoud (Damascus Gate) via the al-Majles Gate. However, the Israeli forces deployed on al-Wad Street, established iron checkpoints, prevented hundreds of protestors from moving forward, beat and pushed them, confiscated the flags, forcibly dispersed them and smashed glass of some shops on the streets. Dozens of civilians were able to reach al-‘Amoud Gate and protested in the area for several hours. The Israeli forces attempted to evacuate the yard of al-‘Amoud Gate by attacking the protestors and forcibly move them away and disperse the protest, which continued until Maghreb (sunset) prayer, but the civilians insisted to stay despite the Israeli attacks. 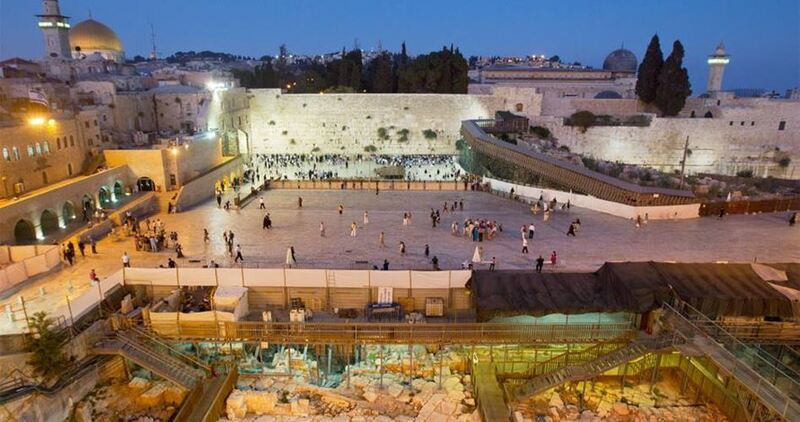 At approximately 17:00, the Israeli forces evacuated the yard of al-‘Amoud Gate. As a result of the Israeli attacks, 2 civilians sustained bruises. The Israeli forces also chased the protestors into al-Sultan Suleiman and al-Mesrarah Streets as the mounted police officers chased them in order to evacuate the area amidst firing live and metal bullets and sound bombs. As a result, a 16-year-old civilian sustained a live bullet wound. Israeli forces arrested 9 civilians, including 6 children, and questioned them under the pretext of “attacking the police”. The arrestees were identified Abdul Nasser ‘Afanah (14), Sa’di Barqan (15), Mo’men al-Karki (15), Ahmed Fawaqah (15), Yasin al-Resheq (17), Anas Qasem (18), Sami al-Tawil (18), Soheib Siam (17) and Ibrahim Saleh (19). In the evening hours, dozens of Palestinian civilians organized a protest in al-Rour Mount, al-Isawiyah, and al-Ram and al-‘Ezariyah villages in the vicinity of a checkpoint of Shu’fat refugee camp. The Israeli forces closed some streets that were in the vicinity of the confrontation areas while Palestinian young men threw Molotov Cocktails and stones at them. The soldiers fired rubber-coated metal bullets and tear gas canisters at the protestors. As a result, 2 civilians from al-Issawiyah village, was hit with shrapnel of tear gas canisters. The Israeli forces also arrested 4 civilians during the clashes, but their names were not identified. On Saturday, 09 December 2017, for the third consecutive day, dozens of Palestinian civilians organized protests in East Jerusalem to condemn the decision of the U.S. President Donald Trump. On Salah Eden Street in the center of the city, dozens of Palestinians gathered raising Palestinian flags and chanting slogans against the U.S. decision. Before the protestors moved to al-‘Amoud Gate area, the Israeli forces surrounded the participants, and ordered them to move away from the street. Few minutes later, the Israeli Special forces surrounded the protestors from all sides and began beating and pushing the participants in order to forcibly disperse them. After that, the amounted police forces moved into the area and attacked the participants, civilians, and press and ambulance crews and then chased them to the shops and roads, forcing the shops owners to close. The protests on Salah Eden Street continued until the evening. Israeli forces arrested Jehad Abu Znaid, Member of the PLC, and beat her. They also arrested Nasser Qaws, Director of the Prisoner’s Club, and Asil Fehmi Abu Laial (25), and beat her and took off her veil (Hijab). Lawyer Khaldoun Najem said to PCHR that the Israeli forces arrested 14 civilians, including 3 children, and transferred 2 of them to the hospital. One of the wounded civilians sustained wounds to the head and throughout his body and fainted, and the other was a child, who sustained a fracture to his hand palm. Thus, the number of the arrestees increased into 17 civilians, including 3 children and 2 women. The Palestinian ambulance crews said that they conducted premiere medical examinations for a number of the arrestees at Salah Eden Police Station and found that the arrestees sustained wounds, bruises and fractures so the ambulance transferred 2 civilians to receive medical treatment. On Monday, 11 December 2017, protests organized by dozens of Palestinian civilians continued for the fifth consecutive day in al-‘Amoud Gate’s Yard. The protests continued from the morning until the evening during which Israeli forces attempted to suppress the protestors several times by beating and pushing them. The soldiers also chased a girl, who was carrying the Palestinian flag, and beat her and confiscated the flag. 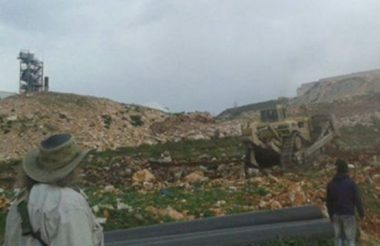 At approximately 09:40 on Friday, 08 December 2017, Israeli settlers accompanied with the Israeli Minister of Agriculture and the Vice Minister of Foreign Affairs, and backed by the Israeli Forces, moved into the area of Ras an-Nkheel, east of Qasrah Village, southeast of Nablus City. The settlers; some of whom were armed, gathered where the villagers detained settlers previously in a cave on 04 December 2017. Before the Israeli forces intervened to force them out, dozens of settlers gathered at the eastern entrance to the village, responding to an invitation from a settlement organization to come to the cave. The settlers headed to the cave, performed some Talmud rituals in front of it and danced in the area, so dozens of the villagers gathered in the area. A number of the Israeli soldiers stepped out of their military vehicles and fired a torrent of tear gas canisters at the Palestinian civilians. As a result, dozens of them suffered tear gas inhalation and received treatment on the spot. On Saturday morning, 09 December 2017, residents of Qasrah village, southeast of Nablus, wake up and found that Israeli settlers of “Magdolim” settlement, damaged around 20 olive trees planted 5 and 10 years ago in a plot of land located in Ras Suniyiah area at the intersection of “Magdolim” settlement, from the eastern side. The plot of land belongs to Mohamed Shehadah Abed al-‘Aziz ‘Odah. The Israeli army’s civil administration last Tuesday, December 12, delivered a demolition order against the only school in the Bedouin community of Abu al-Nawwar, east of Occupied Jerusalem. Spokesman for the Jerusalem Bedouin communities Abu Imad al-Jahhalin told the Palestinian Information Center (PIC) that employees from the civil administration escorted by soldiers stormed Abu al-Nawwar hamlet and put up a demolition order giving the residents 72 hours before they come again to remove the school structures. Jahhalin affirmed that a lawyer had obtained an injunction from the Israeli high court of justice extending the deadline given for the demolition of the school until next Thursday, but the civil administration could come any moment to raze it. He noted that Abu al-Nawwar school had been demolished four times before during 2016, stressing that such an Israeli measure would not intimidate the local residents. Settlement construction in E1 area is considered one of the biggest settlement plans that aim to isolate the south of the West Bank from its north and tighten Israel’s grip over the holy city. A number of Palestinians were kidnapped by the Israeli occupation forces (IOF) while others have had their homes ransacked in abduction sweeps rocking the West Bank at daybreak Sunday. 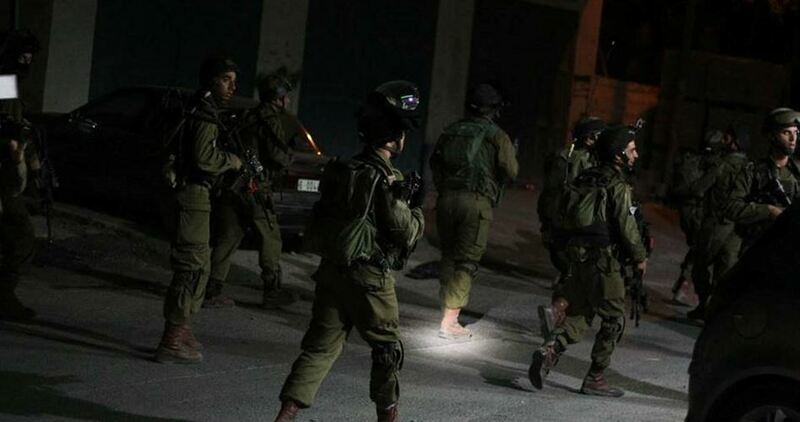 The occupation army claimed responsibility for the abduction of five Palestinians at predawn time on allegations of involvement in anti-occupation protests. The Israeli forces also stole 1,800 Jordanian Dinars from the home of the Palestinian prisoner Mohamed Zakarna in Jenin’s southern town of Qabatiya on claims that they were funneled to anti-occupation parties. At the same time, violent clashes rocked Yabad, south of Jenin, at the crack of dawn, after the Israeli occupation forces rolled into the area and attacked Palestinian protesters with randomly-discharged barrages of tear gas canisters, resulting in injuries. Late on Saturday evening, 19-year-old Hasan Masa’id was kidnapped by the IOF as he passed through the Hamra checkpoint in the northern Jordan Valley. Several Palestinian cars driving in the area, among them Hasan’s car, had also been intensively searched and drivers inspected. 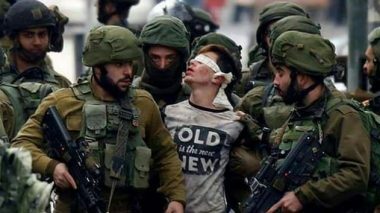 The Israeli occupation forces on Sunday afternoon arrested a Palestinian boy while he was trying to enter Salem court complex in Salem military camp to the west of Jenin city. Local sources told the PIC reporter that tension prevailed inside Salem camp after the Israeli guards, who were searching Palestinian prisoners’ families at the entrance to the courtroom, stopped the boy and arrested him. They added that the guards handcuffed the 16-year-old Nedal al-Amer, who is a resident of Jenin refugee camp, and took him to an unknown destination claiming that a homemade bomb was found in his possession. Many Palestinian children have been arrested recently in the same place under various pretexts. The Palestinian Authority (PA) has expressed its rejection of recent White House remarks describing the Aqsa Mosque’s western wall as part of Israel, condemning any attempt to change the historical and religious status of Occupied Jerusalem. In a press release on Saturday, PA spokesman Nabil Abu Rudeina said that such position confirmed further that the current US administration had lost its role completely as a mediator in the peace process. A senior White House official said last Friday that the US administration “cannot envision a scenario” under which the Western Wall “would not be part of Israel” in a future peace agreement with the Palestinians. The official underscored this point in a briefing with reporters in advance of this week’s visit to Israel by US vice president Mike Pence.